The Spring Jump is a move used in Mario vs. Donkey Kong. 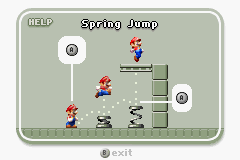 The move is executed by jumping off a spring with timing, allowing Mario to gain vertical height. This page was last edited on February 19, 2018, at 01:08.